Quinnipiac’s latest poll shows Romney behind but with leads in promising areas. One big opening is that by 56-38 percent, voters disapprove of Obama’s handling of the economy. 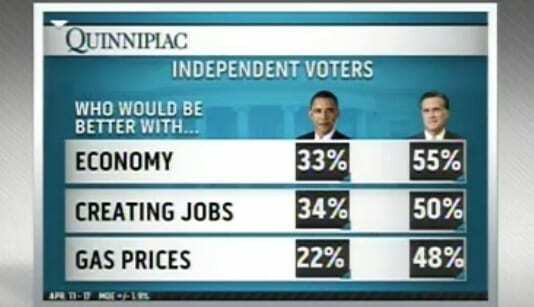 In addition, Romney is polling above Obama on key issues including the economy and creating jobs, and is aso ahead among independents. This entry was posted on April 19th 2012 at 4:15pm/16:15 and is filed under Elections. You can follow any responses to this entry through the RSS 2.0 feed.